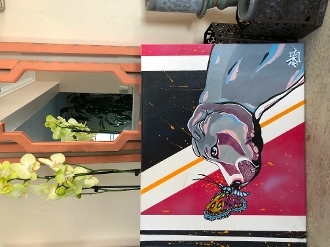 Beautiful hand-painted pit bull and butterfly on pink background is available as a special item during the month of October to one lucky buyer. This painting is on 20 x 16 canvas, painted by True Fit Tattoo artist and pit bull advocate. A portion of the proceeds from the sale of this item will go to Susan G. Komen for National Breast Cancer Awareness in the month of October. Support TWO great casues with one purchase!